SUBHEAD: Indigenous leadership is strong and know leaving fossil fuel in the ground is the only solution. This year’s massive buildup of resistance to the Dakota Access pipeline follows closely on the heels of the victory over Keystone XL pipeline, something often credited to feverish organizing by 350.org. But years before 350’s involvement, there was the Indigenous Environmental Network, which launched that movement and its “Keep It In the Ground” messaging. Dallas Goldtooth: We can only focus on this cherished moment that we have with each other. And the organizing continues. One thing that the uncertainty provides is this constant drive to see what else can we do to change the social dial toward our direction and change the conversation. I think slowly it's happening, it's coming. Standing Rock has now entered into the national narrative in some ways, in some places, so how can we further that? 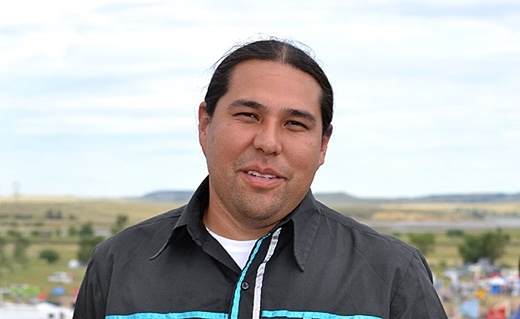 Goldtooth: I've talked to folks who were there, who are in this camp. At its very most there were about 200 people at Wounded Knee at its peak, and a lot of those were people who came in for the weekend and left. At its peak in this camp, we reached up to 3,500 people. People that traveled across the country. They carpooled, hitchiked. They organized caravans and buses. It’s magnificent to see that. It makes me think how different it would have been if we had had Facebook in 1973. Goldtooth: It is. I don’t think there has ever been as large a mobilization and a unified, unilateral Indian Country support like this. We’ve had chairmen, traditional chiefs, chairwomen, the leaders of the leaders of Indian Country, who have come to this camp. Also, we’ve had a lot of non-Native allies that are 100 percent supportive of the fight and struggle here because they see the connections. This fight right now, it’s about the water. And because the messaging is that water is life, so many people can connect with that. Whether you’re native or non-Native, whether you’re from Chicago or Detroit or New Orleans or up in the Bakken, we all understand the importance of protecting the water. That brings us together. Indigenous Environmental Network, our organization, has been fighting Dakota Access for about two years, when they first applied for the state permits. In South Dakota, we were intervening in the Keystone XL stuff, and we saw Dakota Access come up. So we intervened on behalf of Standing Rock at the time. And even back then we had the Tribal Historic Preservation Office testify saying the court is not consulting with us: “We have not been consulted. There are sacred sites out there that they missed.” And that was two years ago. And look where we’re at now. Goldtooth: One hundred eighty-nine have had resolutions or statements of solidarity with Standing Rock. That’s amazing, historic. The crazy part is a lot of tribes that are heavily dependent on resource extraction have also come out in support. Three Affiliated Tribes—30 percent of the Bakken oil shale is under their lands and they participate in. The Navajo Nation, who is heavily dependent on coal. The only solution forward is to keep it in the ground; regulation is not going to work; a more sustainable method of extraction is not going to work. We indigenous people have been saying keep fossil fuels in the ground from the get-go. Although it has been frustrating to see the climate movement overall be slow to adopt that, it’s also amazing and welcome now. It is indigenous people who are often – though not all the time –on the frontlines of climate change. It is oftentimes indigenous people, poor people, forest-dependent nations, water-dependent nations—they’re the first ones to feel the rapid sea-level rise. Those communities, those nations are still dependent on subsistence lifestyles; they’re living off the land. Our relatives in the Arctic are feeling it, their entire livelihoods. Even if they wanted to have absolutely traditional food diets, they can no longer do that because the animals’ life patterns are completely altered. We have to be mindful that even if we transition to 100 percent renewables, it doesn’t necessarily mean that society is just, it doesn’t necessarily guarantee that poor communities will have access to basic needs. When we talk about this transition, we have to make sure it’s in line with the principles of social justice and environmental justice.